Beginning with SAS® 9.4, you can embed graphics output within HTML output using the ODS HTML5 destination. This technique works with SAS/GRAPH® procedures (such as GPLOT and GCHART), SG procedures (such as SGPLOT and SGRENDER), and when you create graphics output with ODS Graphics enabled. Most (if not all) existing web browsers support graphics output embedded in HTML5 output. The same SVG graph, scaled at 90% and then at 200%. But 100% crisp! Note that the ODS PREFERENCES statement above resets the ODS environment back to its default settings when you use the SAS windowing environment. The technique above also works when you use the ODS GRAPHICS ON statement with other procedures that produce graphics output (such as the LIFETEST procedure). Note that the ODS HTML5 destination supports the SAS Graphics Accelerator. The SAS Graphics Accelerator enables users with visual impairments or blindness to create, explore, and share data visualizations. It supports alternative presentations of data visualizations that include enhanced visual rendering, text descriptions, tabular data, and interactive sonification. Sonification uses non-speech audio to convey important information about the graph. You can use the ODS HTML5 destination in most situations where you need to embed all of your output into a single HTML output location. For example, when you email HTML output as an attachment or when you create graphics output via a SAS stored process. If you currently use the ODS HTML destination, you might want to experiment with the ODS HTML5 destination to see whether it meets your needs even if you cannot completely switch to it yet. Embed scalable graphics using the ODS HTML5 destination was published on SAS Users. The ODS destination for PowerPoint uses table templates and style templates to display the tables, graphs, and other output produced by SAS procedures. You can customize the look of your presentation in a number of ways, including using custom style templates and images. Here we'll learn about using background images. The post Background images and the ODS destination for PowerPoint appeared first on SAS Learning Post. Creating reports for the corporate intranet. Creating a responsive design so that content is displayed well on all devices (including mobile devices). Emailing HTML within the body of an email message. Embedding figures in a web page, making the page easier to send in an email. These tasks show the need for and the true power and flexibility of HTML. This post shows you how to create HTML outputs for each of these tasks with the Output Delivery System (ODS). Some options to use include the HTML destination (which generates HTML 4.1 output by default) or the HTML5 destination (which generates HTML 5.0 output by default). With the HTML destination and PROC REPORT, you can create a summary report that includes drill-down data along with trafficlighting. The first ODS HTML statement uses a COMPUTE block to create drill-down data for each Country variable. The CALL DEFINE statement within the COMPUTE block uses the URL access method. 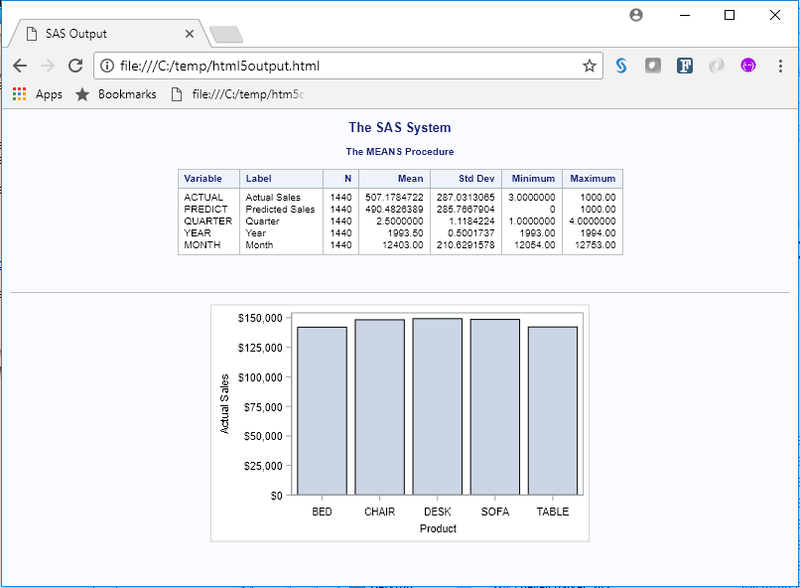 The second ODS HTML statement creates targets for each of the drill-down values in the summary table by using SAS macro language to subset the data. The filename is based on the value. Trafficlighting is added to the drill-down data. The added color is set to occur within a row when the data value within the Actual Sales column is larger than the data value for the Predicted Sales column. One approach to generating HTML files is to assume that users access data from mobile devices first. Therefore, each user who accesses a web page on a mobile device should have a good experience. However, the viewport (visible area) is smaller on a mobile device, which often creates a poor viewing experience. Using the VIEWPORT meta tag in the METATEXT= option tells the mobile browser how to size the content that is displayed. In the following output, the content width is set to be the same as the device width, and the initial-scale property controls the zoom level when the page first loads. The HTML destination and the METATEXT= option set the width of the output to the width of the mobile device, and the zoom level for the initial load is set. Sending SMTP (HTML) email enables you to send HTML within the body of a message. The body can contain styled output as well as embedded images. To generate HTML within email, you must set the EMAILSYS= option to SMTP, and the EMAILHOST= option must be set to the email server. To generate the email, use a FILENAME statement with the EMAIL access method, along with an HTML destination. You can add an image by using the ATTACH= option along with the INLINED= option to add a content identifier, which is defined in a later TITLE statement. For content to appear properly in the email, the CONTENT_TYPE= option must be set to text/html. The MSOFFICE2K destination is used here instead of the HTML destination because it holds the style better for non-browser-based applications, like Microsoft Office. The ODSTEXT procedure adds the text to the message body. The FILENAME statement with the EMAIL access method is used. The ATTACH= option specifies the image to include. The INLINED= option specifies a content identifier. The CONTENT_TYPE= option is text/html for HTML output. The ODSTEXT procedure adds the text before the table. The TITLE statement defines the “logo” content identifier. The ODS HTML5 destination has many benefits, such as the ability to embed graphics directly in an HTML file (and the default file format is SVG). The ability to embed the figure is helpful when you need to email the HTML file, because the file is self-contained. You can also add a table of contents inline to this file. 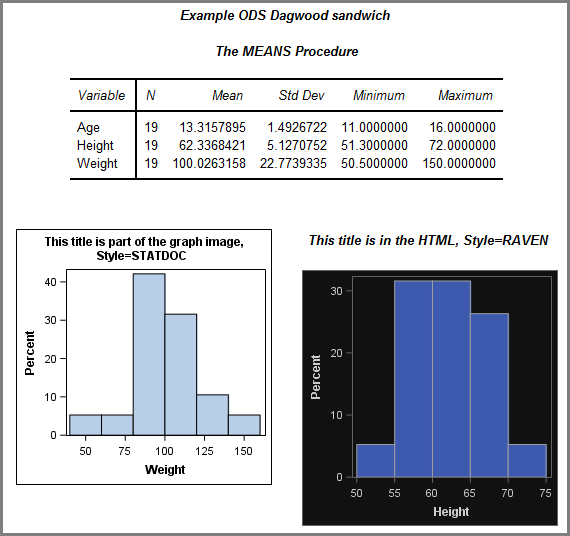 The ODS HTML5 statement creates a table along with an embedded figure. The image is stored as an SVG file within the HTML file. HTML is used in many ways when it comes to reporting. Various ODS destinations can accommodate the specific output that you need. The many faces of HTML was published on SAS Users. It’s true. 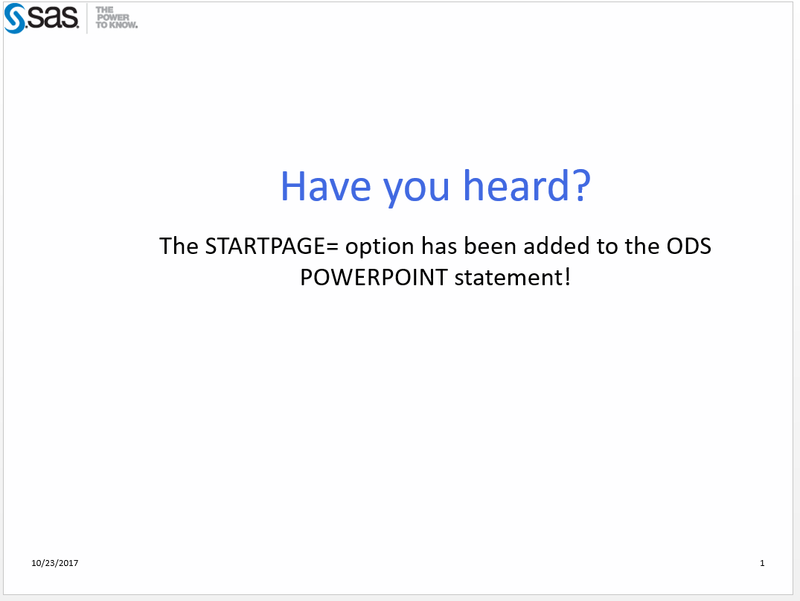 The ODS destination for PowerPoint now has the STARTPAGE= option, which provides you with greater control and flexibility when creating presentations. Added to the ODS POWERPOINT statement in SAS® 9.4TS1M4, the STARTPAGE= option enables you to force the creation of a new slide between procedures and between ODS layout containers. Inserting a slide break between layout containers is one of the most impactful ways that you can use this option. A new layout container does not automatically trigger a new slide within the presentation. A new slide is started when the current slide is full. That is the default, but the new STARTPAGE= option gives you the ability to start a new slide between containers even if the current slide is not full. Shown below are four procedures placed within three layout containers. The first PROC ODSTEXT step is placed in the first layout container. Its purpose is to generate a slide of text, with that text roughly centered in the slide. The second PROC ODSTEXT step is in the second container. Its purpose is to provide useful information about the table and graph. The PROC TABULATE and SGPLOT steps make up the third container. They are the results of the analysis and, as such, need to be displayed side by side. Let’s look at the default behavior. In this example, the STARTPAGE= option is not used. Those results are not what we hoped they would be. The output from the second PROC ODSTEXT step, which is to provide information about the table and graph, is on the first slide. So is the graph!!! And the graph does not look good because it is the wrong size. The table is by itself on the second slide. This is not the desired output at all. Here Is Where STARTPAGE= Helps! 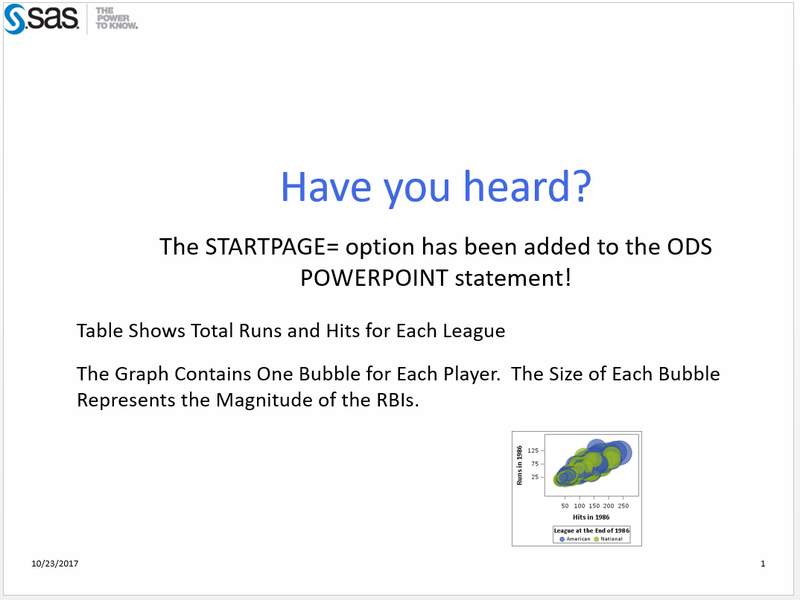 In this example, an ODS POWERPOINT statement with the STARTPAGE= option is added. It is placed after the ODS LAYOUT END statement for the first container. The STARTPAGE= option gave us exactly what we need. The first slide contains just the text (from the first layout container). 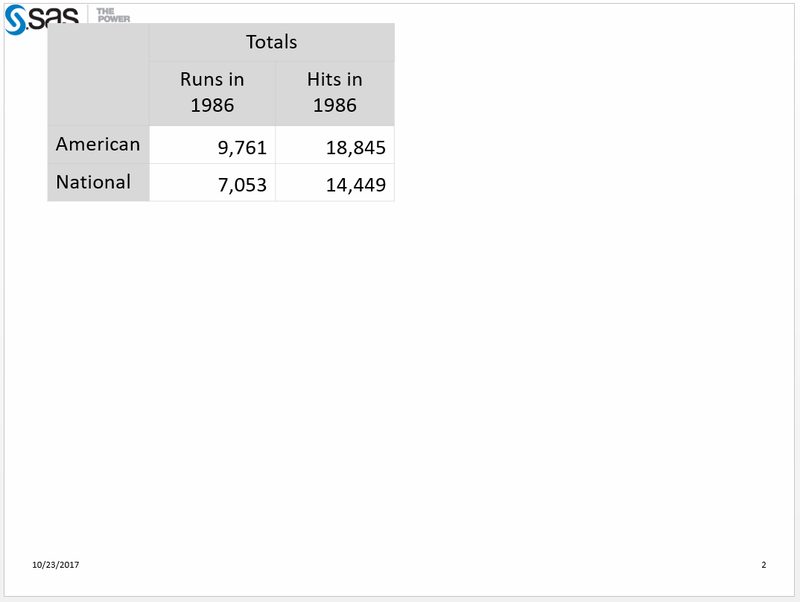 The second slide contains more text along with the table and graph (from the second and third layout containers). The most important thing to know about using the STARTPAGE= option with layout containers is that it has to be placed between containers. It cannot be placed within a container. So you cannot put the statement between the ODS LAYOUT GRIDDED and ODS LAYOUT END statements. For more information about ODS destination for PowerPoint and all of its options, visit this The Dynamic Duo: ODS Layout and the ODS Destination for PowerPoint. Take a peek at it for more examples of using ODS Layout with the ODS destination for PowerPoint. The ODS Destination for PowerPoint Has a New Option was published on SAS Users. Do you need multiple graphs on a page? We have got you covered! 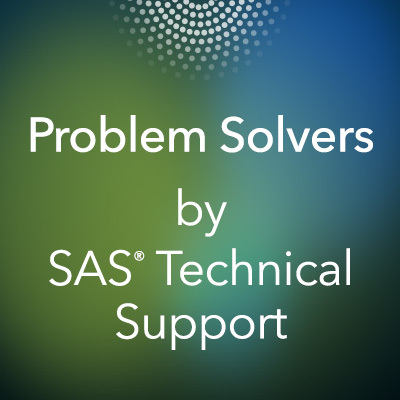 If you use SAS® software to create a report that contains multiple graphs, you know that each graph appears on a separate page by default. But now you want to really impress your audience by putting multiple graphs on a page. Keep reading because this blog post describes how to achieve that goal. 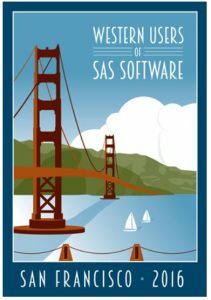 With newer versions of SAS, there are many different options for putting multiple graphs on a single page. This blog post details these different options based on the following ODS destinations: ODS PDF, ODS RTF, and ODS HTML destinations. The ODS PDF destination is the most commonly used ODS destination for putting multiple graphs on a single page and it also offers the most options, which are described below. 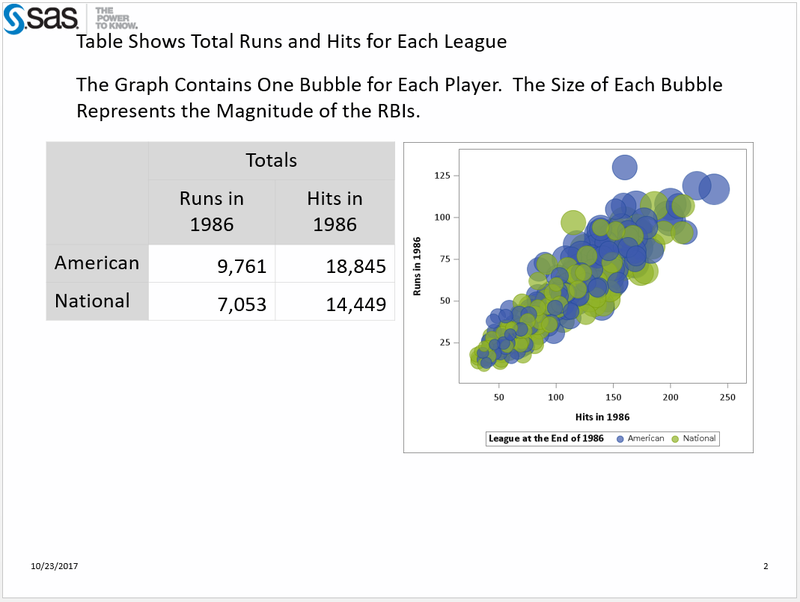 You can also put multiple graphs on the same page in a PDF document using the SAS/GRAPH procedure PROC GREPLAY. While the GREPLAY procedure has been around a long time, it is still a very useful option in many situations. It cannot directly replay graphics output created with the SG procedures and ODS Graphics. It cannot directly replay text-based output such as that created with Base® SAS procedures like PROC PRINT and PROC REPORT. When you create multiple graphs with the ODS HTML destination, they are stacked vertically on the same web page by default. You can scroll up and down through the graphics output using your web browser’s scroll bar. In most situations, using PROC GREPLAY is a good option for displaying multiple graphs on a single web page. Do you need multiple graphs on a page? We have got you covered! was published on SAS Users. 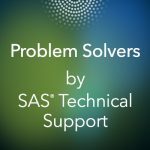 Tips for working with Color Names, Formats, Macros, ODS, Excel®, and PROC REPORT was published on SAS Users. Here's an example program that changes graph style and title behavior within a single ODS output file. You should be able to try this code in any SAS programming environment. Here's the result, plus some important items to note about this technique. It's a good practice to distinguish each ODS destination with an ID= value. This allows you to reference the intended ODS stream with no ambiguity. After all, you can have multiple ODS destinations open at once, even multiple destinations of the same type. In my example, I used ID=dagwood to make it obvious which destination the statement applies to. You can use this technique to modify only those directives that can change "mid-file" to apply to different parts of the output. You can't modify those items that apply to the entire file, such as PATH, ENCODING, STYLESHEET and many more. These can be set just once when you create the file; setting multiple different values wouldn't make sense. Here's one more example that puts it all together. Have you ever wanted an easy way to check the appearance of the dozens of different built-in ODS styles? 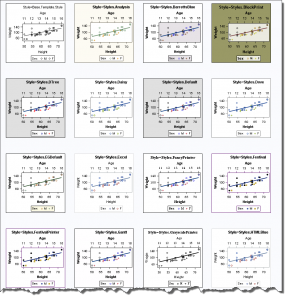 Here's a SAS macro program that you can run in SAS Enterprise Guide (with the HTML result on) that generates a "sampler" of graphs that show variations in fonts, colors, and symbols across the different styles. 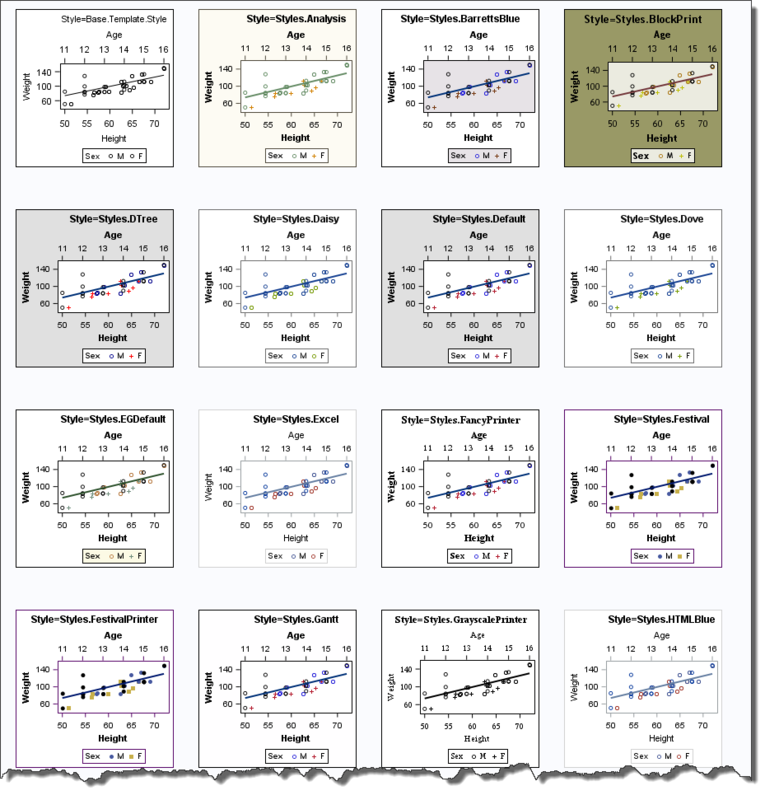 This example uses ODS LAYOUT (production in SAS 9.4) to create a gridded layout of example plots. If you want to try this in SAS Studio or in SAS University Edition, you can adjust one line in the program (as noted in the code comments). The post Using the ODS statement to add layers in your ODS sandwich appeared first on The SAS Dummy.